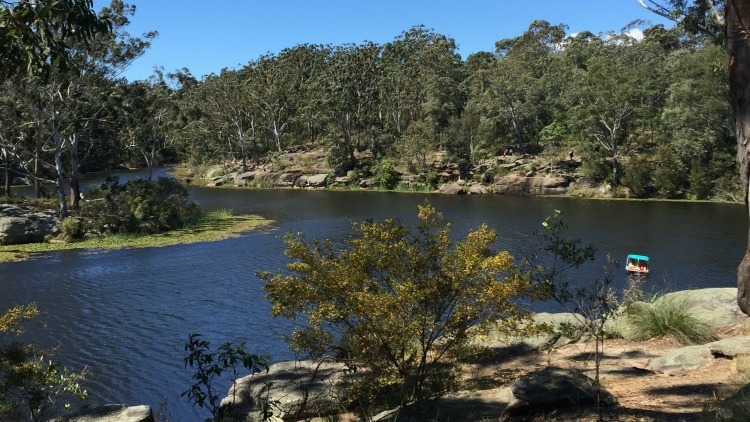 Lake Parramatta Reserve is one of Western Sydney’s best kept secrets. In fact, despite having lived in the area for almost 10 years, it wasn’t until recently that I became aware of this picturesque and family friendly spot. 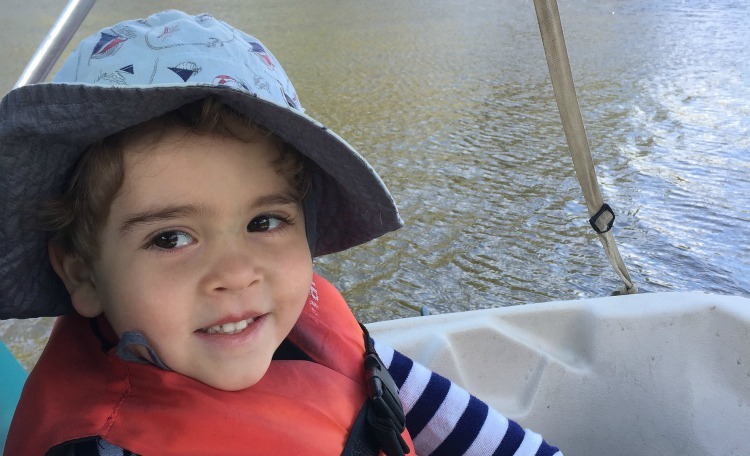 In the past year it has undergone a number of improvements and now, in addition to being able to take a fantastic and easy bush walk around the perimetre of the lake, play in the playground and lunch in the cafe, you can swim in a specially designated spot and now, hire water craft through the fantastic Parramatta Rowboats! Our most recent visit to the reserve was to enjoy this last activity. The entire family was excited in the lead up to our boating adventure- it’s not an every day experience for any of us and we all thoroughly enjoy doing something new. My one reservation as the day dawned was the quite intense wind we were experiencing. However, once we set out, this fear was laid to rest since the trees and cliffs surrounding the water provided a natural buffer and shelter against the worst of the wind. The lake itself was surprisingly calm and we all enjoyed the peaceful serenity of being out on the water. We arrived at the lake early Saturday morning and joined a couple of other curious families on the dock. We were assisted by a very friendly and helpful man from Parramatta Rowboats who discussed with us the pros and cons of each type of craft available for hire. Of course, with a 4 year old and 18 month old, the kayaks, paddle boards and canoes were off limits for the time being! But we were left with two excellent options- the peddle boat and rowboat. The terrific shade, stability and seating arrangements of the peddle boat made it the clear winner. I very much look forward to exploring the other options as my children get older and become more active participants. Put On Your Life Jacket! Adults who can swim 50m or more are able to use all of the equipment on offer without requiring a life jacket but of course it is necessary for the little ones to have one on before embarking. I was impressed by the quality and different sizing options of the jackets on offer and any concerns I had about the safety of the children were immediately dismissed. The staff at Parramatta Rowboats are extremely obliging and are very concerned with seeing the children in the right size jackets and in seeing you all safely on board your boat. If your little one is 10kgs plus (there being no age limit as such, but rather a weight limit), they are able to join you on the boat in a specially designed lifejacket. 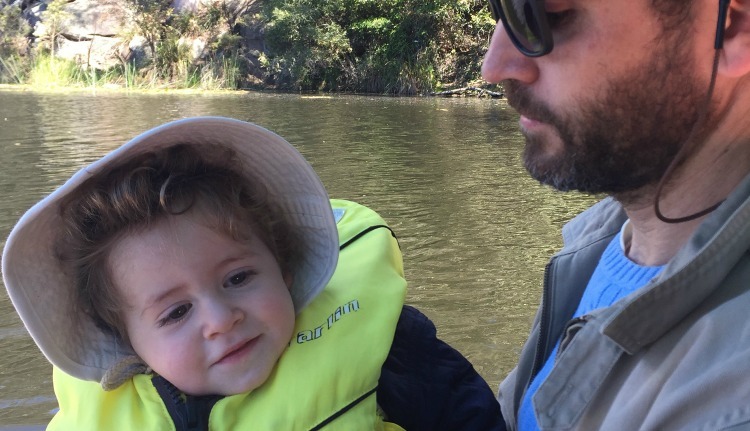 My 18 month old was a little wary of the life jacket at first (apparently tears are extremely common when putting them on!) 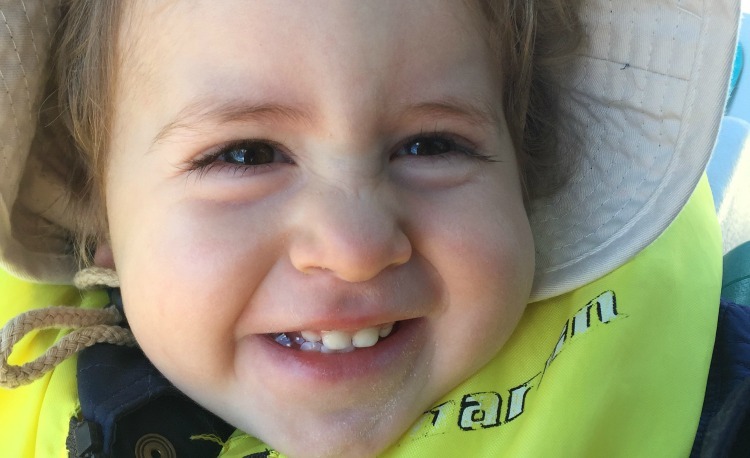 but once it was all clipped up and he was seated between my husband and I in the front of the boat, he was a natural little mariner and nothing could wipe the enormous grin from his face! We all had a bit of a laugh at the awkwardness of getting onto the boat but in actual fact it was incredibly safe and stable. My husband and I sat in the front with the peddles, my little one in between us (to prevent him diving in after his beloved ducks!) and my eldest had the entire two seats in the back to himself which he was extremely thrilled about and which clearly appealed to his current desire to be more grown up. Depending on the age of your children then, you could fit 5 people in this particular craft with ease. Older children could also help out with the peddling (depending on the length of their legs) since it was really rather easy, not unlike a bicycle and the water actually offered very little resistance which meant that it was easy to enjoy our surrounds without working up too much of a sweat. And we were off! I’m extremely keen to immerse my children as much as possible in the natural world and this trip provided the perfect opportunity and excitingly, from an entirely new perspective. We saw so many wonderful creatures- a water dragon scrabbling in between the rocks, ducks dabbling, some cormorants fishing and some dusky moorhens walking across the lily pads, light as a feather. In addition to the native fauna, there was so much in the way of flora to observe too. My four year old was fascinated by the lily pads- asking if they’d be able to hold his weight and marvelling at their lengthy root system. There was wattle too and a number of different gums. My little one was captivated by the ducks of course but also by the cormorants as they dived and zoomed through the water. Even I hadn’t had the opportunity to watch them fish so closely before and it was a wonderful thing to behold. We were on the water for an hour but hire is also available for 4 hour blocks or even an entire day if you’re feeling extremely adventurous (and fit!). The lake is quite large and there are many nooks and crannies to explore. It is important on the lake to be mindful of areas that are off limits and also the fact that the water close to the edge can be quite shallow- we saw another set of adventurers get stuck which wouldn’t be much fun! We had the most glorious, relaxing and yet fun filled experience as a family and it’s one that I have no doubt we will repeat again. Both of my boys would have quite happily remained on board for longer and were full of smiles for the remainder of the day. As wise Ratty said in Wind in the Willows, ‘there is nothing- simply nothing- half so much worth doing as simply messing about in boats’. On a beautiful sunny day, out and about on Parramatta Lake, I couldn’t agree more with this sentiment. Don’t get caught out! While the peddle boats have sun shades, the other options do not. Pack hats, wear sunscreen and stay sun safe! Don’t be put off by the wind. We went on a very windy day and found the natural surrounds of the lake provided excellent shelter. My husband was, for the most part, extremely capable of peddling all four of us around on his own. Come early if you can. Not only will you beat the midday/afternoon heat, the park can become extremely crowded by lunchtime and parking is limited. Parking outside the park is possible but it’s a fair walk in. 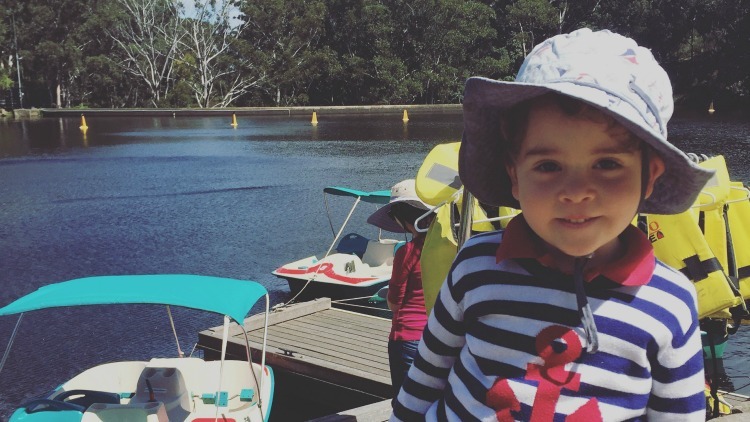 Parramatta Rowboats offers fantastic boating options for the entire family. My 18mth old had a ball! Pack a picnic and your swimmers and spend the day in this beautiful location. For more info, see our event post or visit Parramatta Row Boats website. Stephanie Boyle is currently a stay at home mother with two gorgeous children. Prior to becoming a mum she trained as a lawyer and worked in various Government positions. She is currently completing a Masters of Teaching. Stephanie and her Algerian husband Kamel have two sons, Ayman (3 years old) and Younes (3 months) and they are doing their best to raise their sons as tri-lingual global citizens. When Ayman arrived three years ago, it became immediately apparent to Stephanie that neither of them were homebodies and so they set off on what would become three glorious years (and counting!) of adventure and excitement throughout Sydney and its surrounds. Stephanie believes that childhood should be pure magic and she is on a continual mission to make this the case for her sons. She loves discovering new places and activities, throwing amazing parties and running a bookclub for her boys and their little friends. In addition to her reports for ellaslist, you can also follow Stephanie and her boys onInstagram @moukinina. We Visited The Epic Parramatta Park!